Hello everyone, I hope you having a good week? GCSE results tomorrow for me to be feeling anxious about and then on Friday, off on a walking cruise to Norway which I am super excited about. It has been dream of mine for many years to go to the Norwegian Fjords. I am really pleased with this dress – even though there are still a number of fitting issues. However, I pushed myself a bit and realise that I am getting a little more confident in what I am prepared to have a go at. First up the fabric. I bought this on my trip to Goldhawk Road, At that point I didn’t have a specific project in mind so only bought 1.5 metres. I then got frustrated with myself because I didn’t have enough for what I decided I wanted to do with it (Ultimate trousers, Anna dress). Having just completed a Gather Mortmain dress which I was pleased with (see here) I decided to have a go at making another one but this time with sleeves. 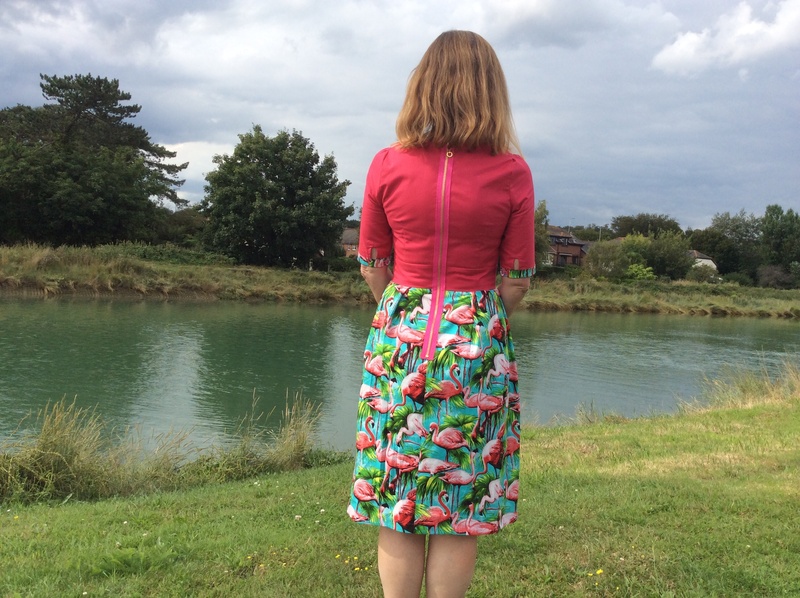 To fit in with the theme of Two is the Magic Number for The Monthly Stitch I decided to make up my Mortmain in two fabrics – I felt the box pleats would show off the flamingos to their best advantage. 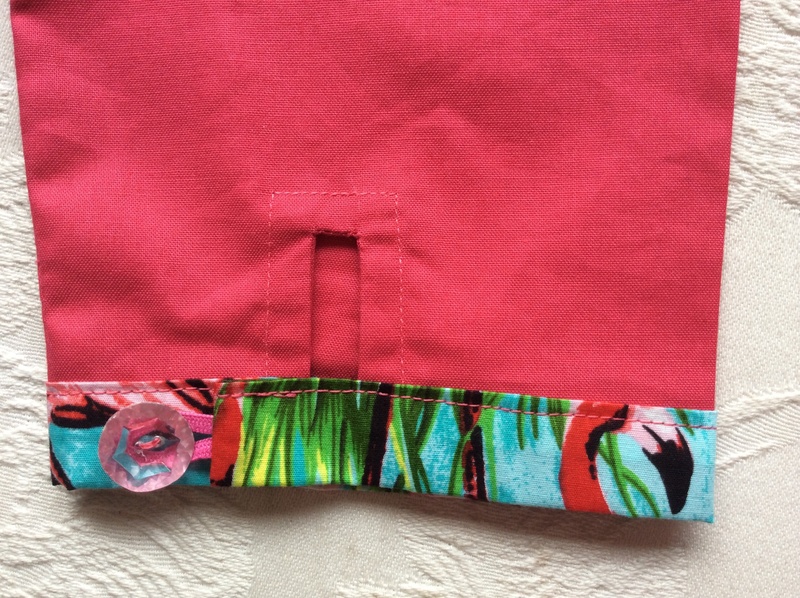 I found a plain cotton in a similar shade to the flamingos in C and H fabrics – I only bought 0.7 of a metre to make the bodice and really had to eek this out. When I looked at the pattern for the sleeves properly I realised that there was a cuff detail with elastics, buttons and keyholes. I immediately dismissed this as being too complicated. However, once I actually sat down to start the dress, I thought I’d try and see how it went and I’m pleased I did! It is worthwhile reiterating here that this is an absolutely brilliant pattern with really clear instructions. I don’t know why I still get so anxious about doing anything for the first time – it is these little cuffs which have given me a sense of achievement with this frock. A few months ago there was a little flurry of knicker making (since replaced by, firstly the Morris Blazer and then the Bettine). I was part of the knicker brigade and bought shedloads of elastic which has since sat languishing somewhere amongst the fabric. I just used this for the loop after having first cut off the lacy part of the knicker elastic. The button is a glass one from my mum’s button box (1960’s). Something I have only realised since I have been sewing is that although I have small boobies I do have large shoulders. I had completely forgotten this when I started to make up the Mortmain (my previously one having been sleeveless it was not an issue). SO annoying! It was incredibly tight under the arms so I decided to do a big scoop out of the fabric and re-sew. I am sure there is a more professional way to do this. It worked to a certain extent – i.e. it feels OK and I can move my arms but looking at the pictures it really is too tight and pulling across the back. Talking of which …. I now absolutely love exposed zips – I bought this delight on EBAY and when it arrived I had to keep looking at it as a thing of beauty. Mr CK caught me staring at it as I had laid it out on the sofa and thought I was bonkers. The experience with the armholes has taught me a valuable lesson – I will now always take extra care with measuring/fitting sleeves. I remember now that when I made my 1960s coat, after all the fuss of putting the shoulder pads in, we decided it would look better without on me, so I took them out again. My final flourish was to use bias binding on the hem – this was because I wanted to make the dress as long as possible and I had used all of my fabric on the length. Whilst I quite like short/above the knee in winter with thick tights, I favour just below the knee in summer because my legs/knees are not what they used to be! Which brings me to another little ponder! 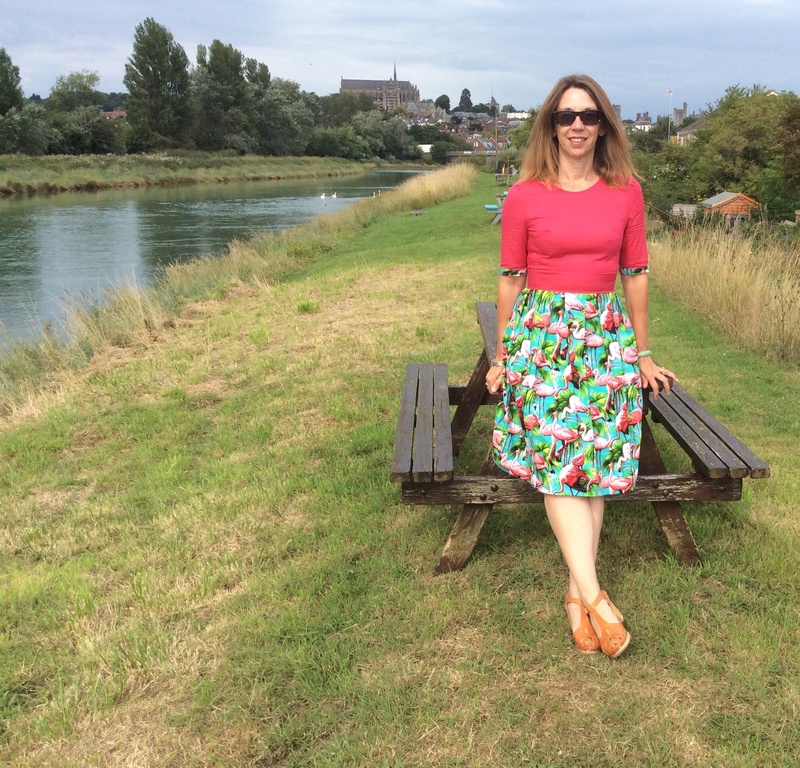 I recently read the following in a FAB new blog – Coolarama which made me have a little bit of a wobble: “I need to stop making cutesy dresses for 20/30 year old’s, I’m a bloody 40 something! 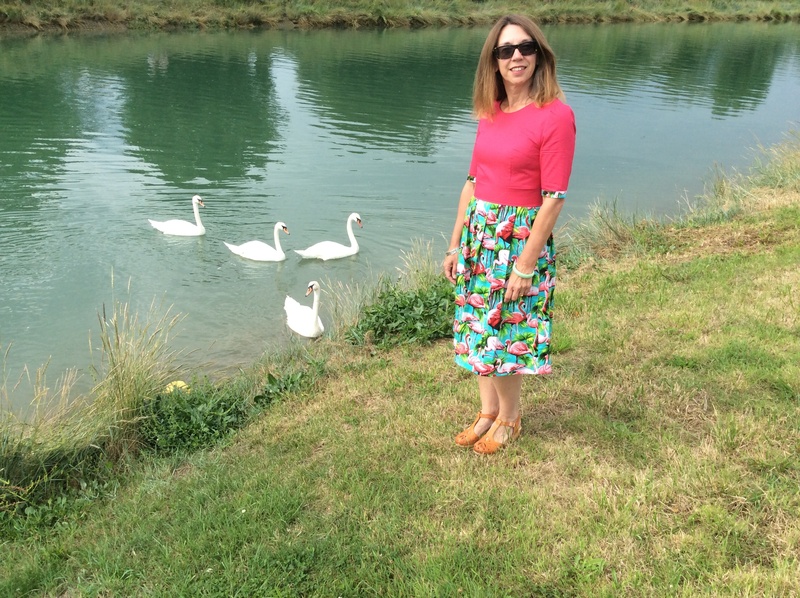 Get a grip and dress like a grown-up!” As I surveyed my recent makes and pondered my own age, I wondered if others might be thinking that about me: Parrots, Frida Kahlo, Flamingos, Queue for the Zoo, Tennis Racquets etc etc. Anyway, hopefully you’ll be pleased to hear that I didn’t ponder that for too long! I love the amazing choices of fabrics we can buy to make really unique clothes for ourselves and I plan to grow old disgracefully making whatever takes my fancy. Just to reinforce that little moment of positivity I just bought a new paid of shoes this morning which will go perfectly with my dress – shame I didn’t have them when I did the photos. Toodle pip dear friends – I am off to continue my dream of becoming “a glittery flamingo in a park full of pigeons” (can’t find where that quotation comes from to credit it but it sure is a cracker (along with another favourite motto of mine – it’s really doesn’t matter if the glass is half full or half empty – there is still room for more wine). Lovely dress and shoes. Beautiful fabric You know I love colour. I love your flamingoes AND those shoes are fabulous! Flamingos! Wow, great dress. That the joy of sewing we put together our own unique combinations. The little cuffs on the sleeves are awesome. Such a great detail. Fab dress and loving the flamingo fabric, all the fiddly details really make it. Also loving the shoes. 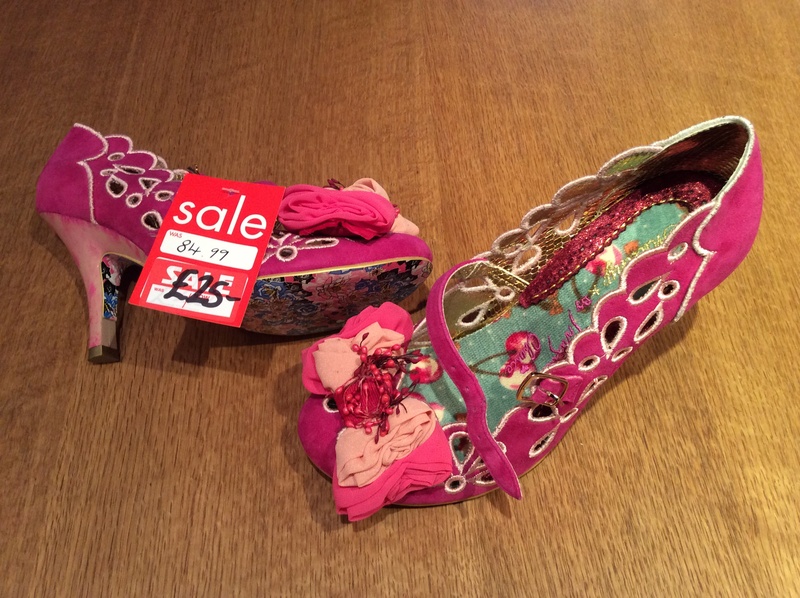 Although I’m trying to stick to my sensible sewing I never said anything about sensible shoes!!!! Carry on making your beautiful crazy dresses. Thanks for the link and good luck with the GCSE’s. Fiona. Hi Fiona, thanks! Results were a mixed bag but overall I’m pleased/relieved – certainly plan to celebrate over the weekend in full flamingo mode! Fabulous dress! And i know what you mean about completing the tricky cuffs, scary when you do it but so worth it once you’ve finished! I don’t know what you mean about inappropriate clothing. Your makes are all gorgeous and look great! Thanks for your lovely compliments! Ahh, Jenny Josephs – fab poem. 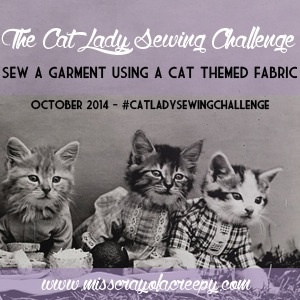 I think my own clothes making is the other way – i.e. a little more formal/structured. Thanks for your lovely comments! I think I might be getting more into florals. Have just finished a Liberty Anna (not yet blogged) and I really like it and I have fabric to make a shirtdress in an autumnal floral print. Will post pics of Norway in next post to encourage you to go! I didnt realise you were in your forties! You dont look a day over 26! Dress is gorgeous and beautifully made- 2nd flamingo print dress isnt it – I think you like flamingoes😃. I dont buy into dressing rules either. Its just someone’s loud opinion thats all. Hi Hila, you are too kind but ssshhhhhh, just between you and me, I have already said toodle pip to my forties. 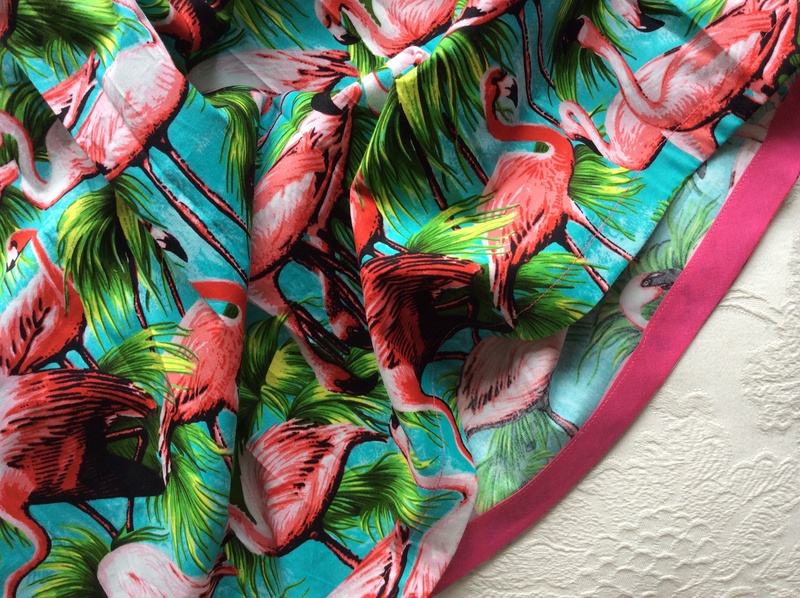 Yep, second flamingo dress and I’ve got another 1.5 metres of a different flamingo fabric to make a work shirt. The dresses you make are gorgeous and unique! I don’t hold with this ‘dress for your age’ malarkey. I’m not really sure what it means. Keep doing what you’re doing as long as you’re happy and comfortable! Good luck with the GCSE results tomorrow – I’m pretty nervous about my GCSE class too but I tend to be more nervous than the students! Hi Corrine, hope your results were what you hoped for? My Lit results were good – the Language not so much. Thanks for your lovely comments on my frocks! The results were OK but there are a couple of very disappointed students. When you only have 10 students in your class each student makes a big impact on your statistics! Never mind! Thanks for your lovely comments! Hope your little one was pleased with results? Such a stunning Mortmain, I love the fabric blocking combo. 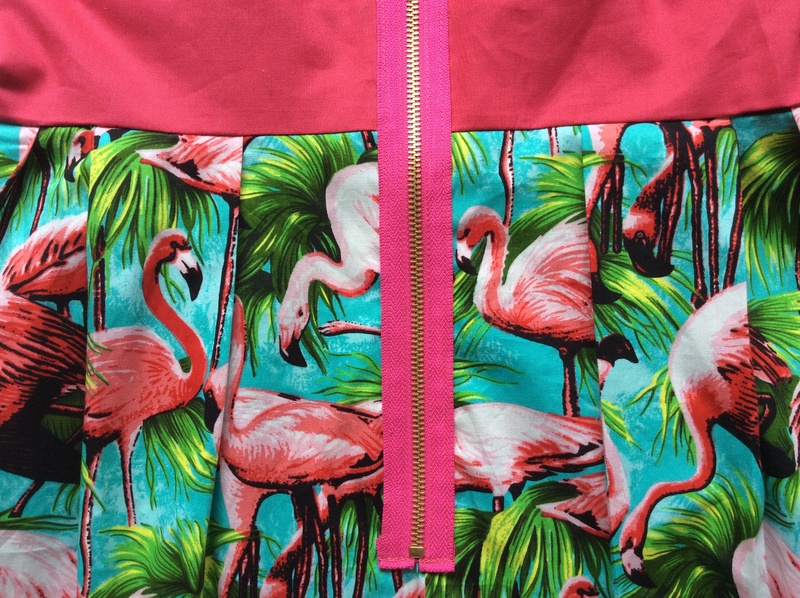 I mean, flamingos, who wouldn’t want a dress with flamingos! Are you going to make one too? There seem to be a lot of Flamingo prints around at the moment. 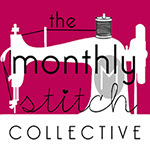 ← A Fabric Godmother indeed!